The cloud computing expert is not living up to the expectations of its IPO investors. 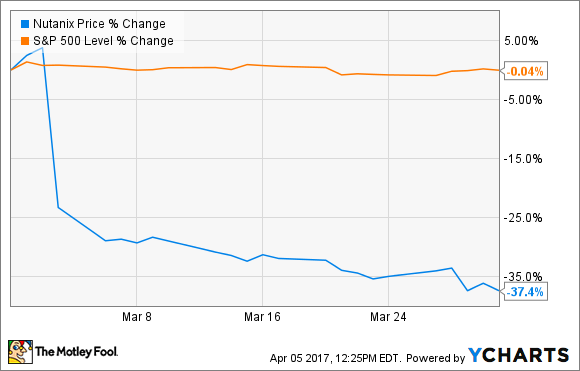 Shares of Nutanix (NASDAQ:NTNX) fell 37.4% in March 2017, according to data from S&P Global Market Intelligence. The enterprise cloud computing specialist reported second-quarter earnings at the very start of March, beating analyst estimates on both the top and bottom lines. But the report came with a side of disappointing next-quarter guidance, and Nutanix shares fell more than 20% the next day. Bullish analysts see Nutanix as a tasty takeover target for larger networking companies that lack a cloud computing strategy. But earnings remain firmly negative and the company's cash flows are paper thin, and higher memory prices are putting even more pressure on the bottom line. Any buyer would have some structural work to do before producing positive results from a Nutanix acquisition. The young stock has lost 52% of its original value, barely six months after entering the public market. With so little fundamental strength to consider, I can't blame investors for taking a darker view of the company. Nutanix has a lot to prove before becoming an appealing choice for long-term investors.